Classes have been announced for this year's TatDays. The TatDay page link is HERE. This year's theme is "Tatting Angels Among Us." There are lots of angel patterns, but other things too. On that page, there are links near the top for the list of teachers, classes, class schedule, & etc. There are lots of teachers this year. I see many who have often taught before and some new names too. The classes I am teaching are all listed as shuttle tatting. Needle tatters are welcome, but I'm not experienced enough with it to be able to help you adapt the patterns. Registration is supposed to start late May or early June, so keep checking back. I almost hesitate to let you in on my secrets, since I'll have more book buyers to compete with. My go-to source for out-of-print books is http://www.bookfinder.com/ It searches all the book stores so you don't have to look at all of them yourself. You can set it to report the postage to your location as well as the price, which comes in handy since sometimes postage cost can be a deal breaker. (But beware if it reports postage as 0.00; this may mean the bookseller's site isn't communicating the postage with Bookfinder.) If you are on the prowl for a certain book, check back often. A bargain may pop up and be snatched in a few hours. Been there, done that, as both the buyer and the one who hesitated too long. It's good for in-print books too. I was looking at a knitting book yesterday. Retail price is $25, Interweave has it on sale around $6, but with a hefty additional $6 for postage. Bookfinder reveals a new copy for $8.00 including postage. What Bookfinder doesn't search is ebay, which is my other secret. But don't stick with just regular American ebay. Go to the ebay for other countries. I've gotten some rare vintage books, like Endrucks' "Schiffchen-Spitzen", from German-ebay: http://www.ebay.de/ . British-ebay http://www.ebay.co.uk/ is where I've more than once found Mary Konior books and others at bargain prices. 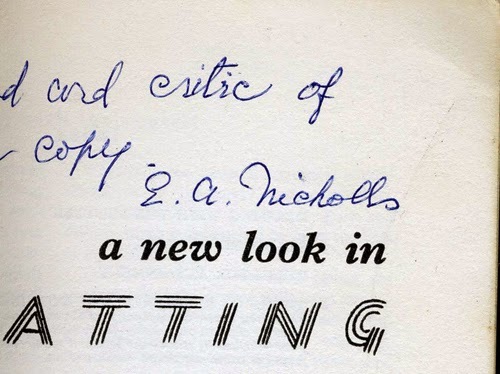 Right now, British-ebay has not one, but two copies of the very rare Elgiva Nicholls "A New Look in Tatting." ** I've seen that one sell as high as $200. One is an auction offered by our own Jane, and the other is a buy-it-now. Both cost more than the copy I got last week from Bookfinder, snicker. **Later: someone has snapped up the buy-it-now copy, so only Jane's is left. Happy bidding! This is my favorite week of the year, and I've got a few days off to enjoy it. In mid-April, the dogwoods and azaleas are in bloom. So are those pink trees, whatever they are. It's a good time to walk to the park, or to the lake. Tomorrow, it's supposed to rain. I can stay inside and get some tatting done. I started this blog way back when to participate in the 25 Motif Challenge. The idea of the challenge was to encourage people to keep actively tatting and show 25 pieces of tatting made within a year. After my first few times, I started assigning myself extra guidelines to make it more interesting though that has also made me more likely to miss the year's deadline when I got sidetracked. My current personal challenge is to make motifs from vintage publications. I got off to a good start, and then got distracted, as usual. I'll have to go back and count motifs to see where I stand. But anyway, I remembered to make a few, misplace them, and find them again. These are from Priscilla Tatting Book No. 2, from 1915, one of my favorites. These particular motifs are from a table cloth with many motifs around panels of linen. 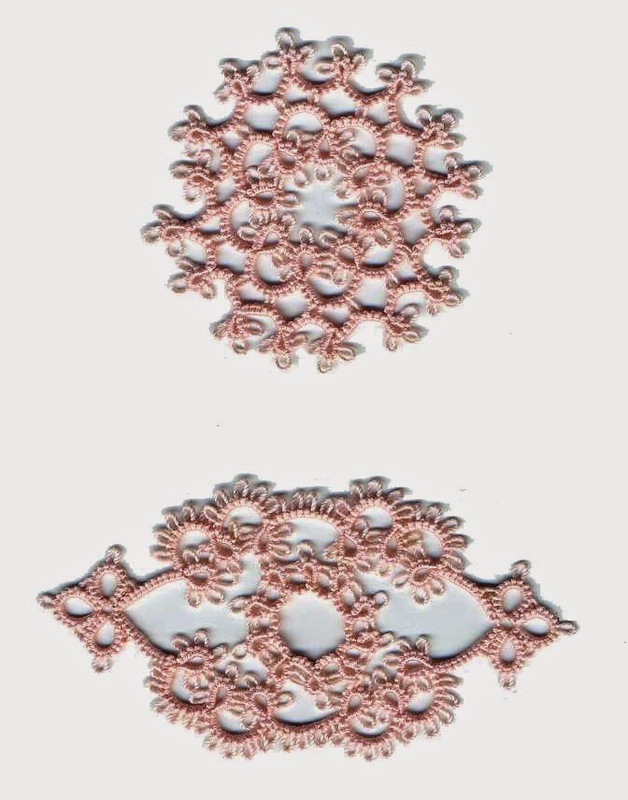 This book is available for free download from the Antique Pattern Library, or for sale from Dover Publications under the name "Tatting Patterns by Julia Sanders." 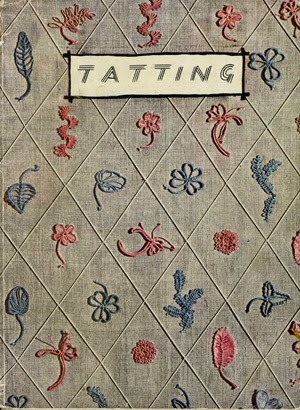 You can also download from Georgia's Archive of Public Domain Tatting Books, but her version is a later edition which is much shorter. So what am I up to lately? Not a whole lot of tatting. I've been seized with designer's block, so I've made lots of little false starts, cut them off and threw them away. I've diverted lots of time into a foray into vegetable gardening. I planted seeds! They came up! Nothing will be ready to eat for a long time. The ensuing combination of hope and patience will surely be character building.